Getting stranded in the wilderness is the thing of movies, getting stranded in the wilderness during winter is the thing of nightmares. Surviving an unplanned night in the backcountry can be trying for even an experienced outdoorsman but to do so during adverse conditions compounds the problems, eliminates many advantages you may have had and makes every decision a matter of life or death. If you venture into remote areas to hunt or hike you need to be prepared and have a plan for handling the worst case scenario. 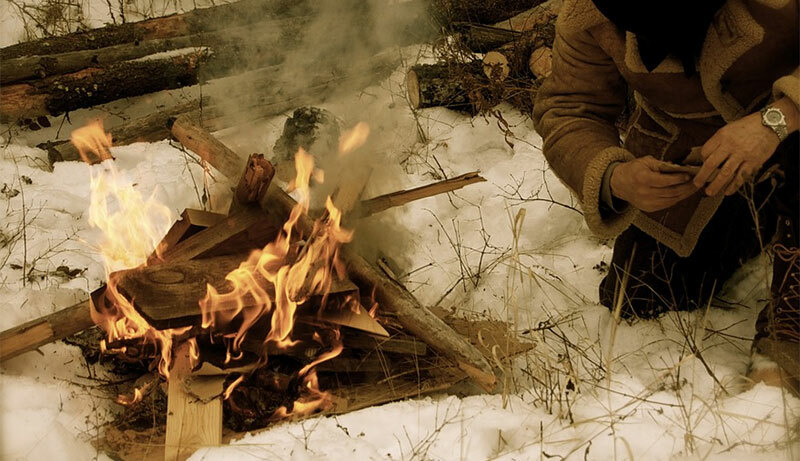 Wilderness survival is always a matter of utmost importance, but when temperatures drop and Mother Nature turns against you it becomes deadly. Even a novice can muddle their way through a night or two outdoors in July but doing so in January is not so easy. You need to understand what your most important needs are and have a plan to address each. In most survival scenarios clean drinking water is the top priority but when temperature alone can kill you everything takes a backseat to shelter. Luckily, there are many easy to construct shelter options available during the winter and some even allow you to take advantage of the frozen conditions that threaten you. The easiest shelter design is a simple A-frame or lean-to, if you have planned ahead and have an emergency tarp you can use it for a roof to decease the time and energy need for construction. Snow has excellent insulating properties so it there is enough available use it to cover the roof and keep out drafts. Don’t forget to cover the floor with either another tarp or soft evergreen branches to protect your from the cold, damp ground. Next you need a fire – not only will it provide lifesaving warmth but it can also be your source for fresh drinking water. In warmer months the forest floor would be an easy source of fuel but during the winter most of this wood will be too damp to burn reliably so you need to look for low hanging dead branches or branches which have fallen and become caught in other limbs. Remember, if you are building a fire inside a shelter make sure it will not catch surrounding materials and that you have a vent to allow smoke to escape. Once you have a fire you can use it to melt snow or ice for a reliable source of drinking water. Obviously you need to treat any possible injuries but you also need to be on the lookout for any possible cold related health problems. Hypothermia and frost bite are the most likely issues to arise and each can be not only debilitating but also deadly. Know the signs and symptoms of each and the possible treatments available for each while stranded. No one plans on getting stranded but it is something you need to prepare for if you wish to survive.